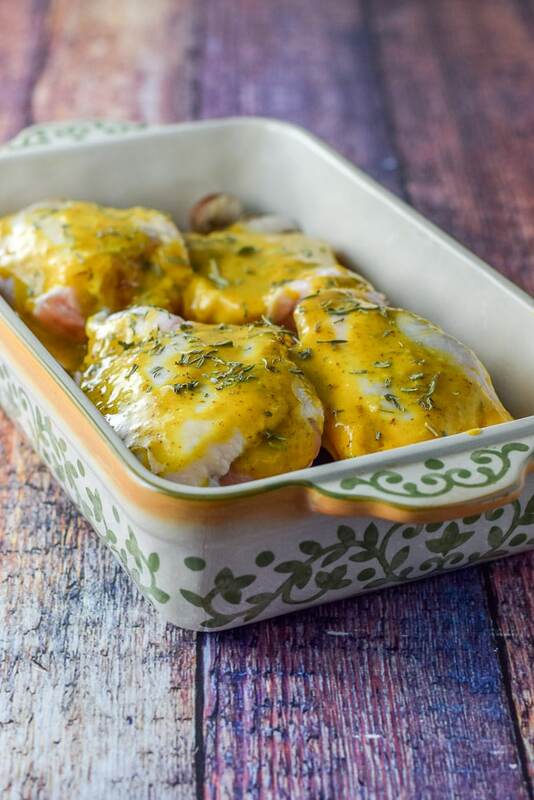 These baked maple mustard chicken thighs are so delicious that you’ll be happy eating them! I am not against honey mustard. In fact, I love honey mustard. But I tend to use maple syrup instead of honey in most of my recipes. I prefer it, not only because I like the taste more than I like honey but I also like that it pours better. Easy pour means faster recipe. Faster recipe means eating quicker!! Eating quicker means happy Lainey! Christopher likes happy Lainey. So, all is good. I like maple syrup so much that I put it in my decaf coffee every day. Yum. But that’s just to name a few. Even more, I did a search on my site to see how many times I used maple syrup and it was a bunch. But I don’t want to bore you with how many, but the above recipes are the highlights! So, what is your favorite sweetener of choice? Certainly leave me a comment because I love knowing these things! The three mustards I used! 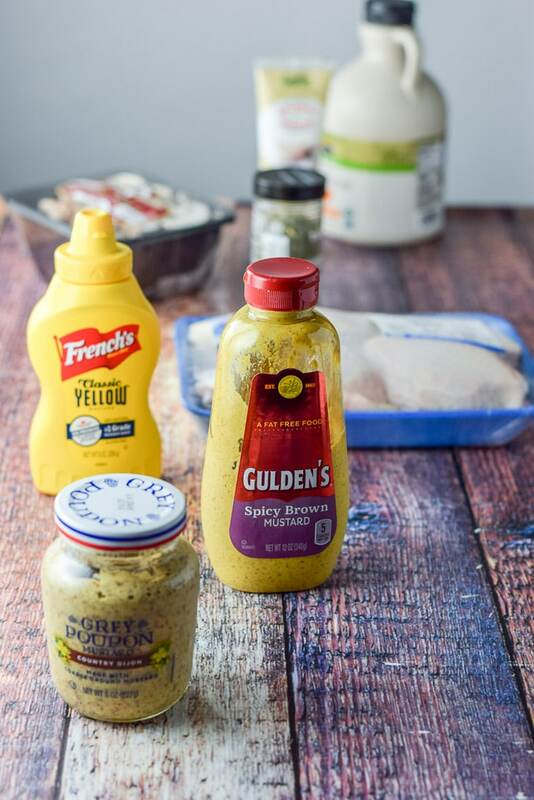 I focused on Gulden’s because it is my favorite of the mustards. Also in the photo are the chicken, mushrooms, olive oil, garlic and my beloved maple syrup! First, I preheat the oven, grab my baking dish, dribble some olive oil over the bottom, and dump the mushrooms in the dish. Next, I put the chicken thighs on top of the mushrooms. I bought bone-in thighs this time because it’s been a while since I’ve eaten them that way. But I still prefer my boneless and skinless thighs though! I take out my 1/3 cup measuring cup and mix a combination of the three mustards to taste. I use roughly equal parts, though I do use less of the Grey Poupon because it’s on the spicy side and I must coddle Christopher. Furthermore, mix the mustards however you prefer. Or simply use one of them if you don’t care about combining the flavors. So, I grab my stainless steel mixing bowl and add my mustard mixture, 1/4 cup of maple syrup, 2 teaspoons garlic paste, 1 teaspoon tarragon and 1/4 teaspoon salt. I also take my whisk and put it to work until all the ingredients are combined. Next, I pour the maple mustard mixture on the chicken. Finally, I pop the chicken in the oven for 55 minutes to an hour. Mmmm. I make a salad and plate one of the thighs with a good dollop of maple mustard sauce and mushrooms. Now, for a closer view of the maple mustard chicken thighs. 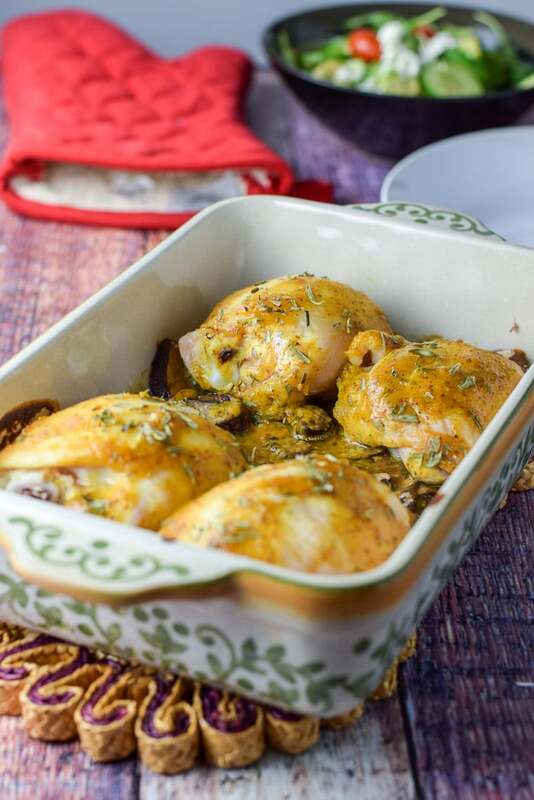 So, I hope you enjoy my Maple Mustard Chicken Thighs recipe because it was super yummy! 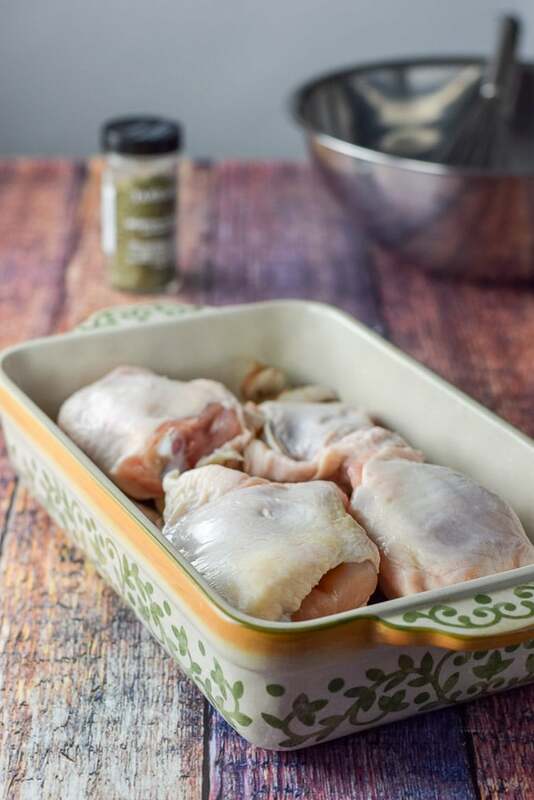 If you’ve tried this maple mustard chicken thighs or any other recipe on the blog, I’d love the hear what you thought about it in the comments below. I love hearing from you! You can also FOLLOW ME on FACEBOOK, TWITTER, INSTAGRAM and PINTEREST to see more of my delicious food and delightful cocktails! 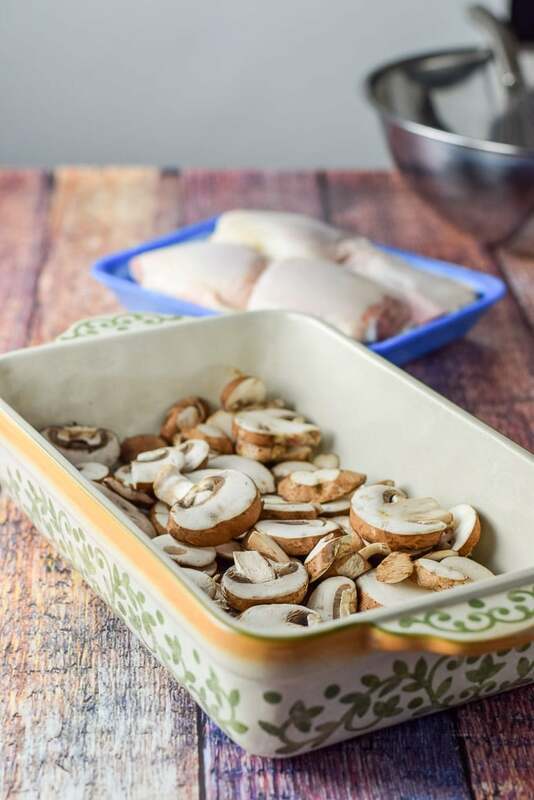 This chicken dish is lovely because it is saucy and loaded with mushrooms! Oooohh, this looks so delicious and easy! And BEAUTIFUL! I never would have thought of using maple syrup this way. I use Splenda or honey a lot for sweetening. If it’s an Asian dish, I’ll also use thick, sweet soy sauce. I’m pinning this one for Sunday Dinner! Thanks so much Michelle! Mmmm, sweet soy sauce sounds divine!! Love maple!!! It is my favorite Fall flavor!! I can’t wait to make this chicken!! That looks delicious and beautiful! My favorite sweetener? I guess it’s the southerner in me — brown sugar is my go-to. Thank you Pam! I like brown sugar too, more than white and usually bake with brown over white!! Thanks so much for answering my question. Haha Patty! Indeed I would share with you!! Love how succulent the chicken is when it’s made with this sauce/marinade! Delish! This looks like a dinner that my whole family is going to love! Maple and mustard is just the perfect combination when it comes to chicken and this is a must for us at any BBQ. I love the idea of a mustard sauce! So much incredible flavor! Need to give this a go! Thank you Angela. It’s very yummy! This flavor combination sounds absolutely amazing on juicy chicken thighs. Looks so good! That’s very interesting that you use 3 different mustards for this chicken! Love it! I have to give this one a try Lainey! Well done, once again!